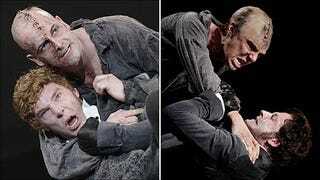 Benedict Cumberbatch is the best "Frankenstein's" monster... evar! As a heads-up, for anyone who is in the UK, the National Theatre Live version of Danny Boyle's Frankenstein is getting a brief encore showing in certain cinemas. There are two versions, one with Cumberbatch as the Monster and Jonny Lee Miller as Doctor Frankenstein, and the other with the two roles reversed (Cumberbatch playing the Doc, etc). I saw the version with Cumberbatch as the Monster and it absolutely blew me away. It is quite possibly THE best acting performance I've ever seen in my life. If you get a chance to see it, grab it with both hands, as it'll never come out on DVD (etc) due to various rights issues, and it's a sad loss that not everyone gets the chance to see it. I'm taking the chance to see the other version, but - as good as Jonny Lee Miller is - I just can't quite see him topping BC as the Monster.